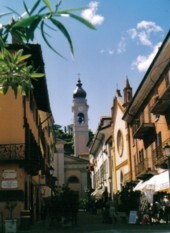 Menaggio is one of the most popular destinations on Lake Como, and makes an excellent holiday base. Menaggio is a small resort on the shores of picturesque Lake Como, in the Lombardy region of northern Italy. Halfway up the western side of the lake, Menaggio has good transport connections to the area's tourist attractions and is a pleasant and convenient place to stay. Menaggio is a popular destination, particularly for holidaymakers keen on outdoor activities. There is an eighteen-hole golf course close to town, and plenty of good walking in the area, from easy strolls to tough mountain hikes, as well as opportunities for swimming, water-skiing, mountain-biking and riding. Menaggio Tourist Information Office (Piazza Garibaldi) stocks a good range of information in English about local activities and sights. For a personal account of hiking in the Menaggio area, see our Lake Como walking page. Keen walkers may also be interested in Lonely Planet's Walking in Italy, which features Menaggio as a recommended access town with plenty of information and detailed description of a 9km walk up Monte Grona from nearby Breglia and a much tougher 22km trek along the Via dei Monti Lariani, above the lake. Although there aren't a huge range of things to see in Menaggio, the town offers a pretty lakeshore lined with trees and flowers, some attractive old buildings and dramatic mountain views as well as a sports centre and a lido for swimmers and sunbathers. From Menaggio you can take boat trips around the lake, and embark on excursions to the lake's scattered gardens and beauty spots. The town has a choice of restaurants, as well as general stores and bakeries where you can stock up on snacks and picnic ingredients. Principally, Menaggio makes an extremely good centre because of its transport links. Ferries arrive there from the northern and southern ends of the lake, and cross the waters to Varenna and Bellagio, while buses run to Lake Lugano, and along the lake, making it easy to visit all Lake Como's attractions. The town itself has a pretty little lakeside promenade and harbour to sit around, and a town square with some cafes. The historic town, sloping up the lakeshore, is appealing if not extraordinarily interesting, but its very attractive setting and status as a communications centre make it an excellent place to stay. 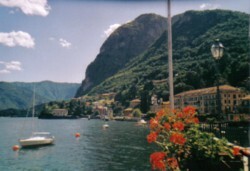 Menaggio can be reached by bus from Como San Giovanni station (trains from Milan). The SPT bus service C10 for Menaggio stops outside the station - buy your ticket before boarding at the station bar or news kiosk. Alternatively, travellers can arrive by ferry from Como or Varenna. Another SPT bus, the C250, links Lake Como directly with Milan's Malpensa Airport in under an hour (see link on the right, and look under 'orari' for current timetables). Off-season the buses run Malpensa - Como, summer services may extend to Menaggio. Otherwise you can change to the C10 in Como and proceed to Menaggio. Tickets for the Malpensa service can be bought in advance or on the bus.